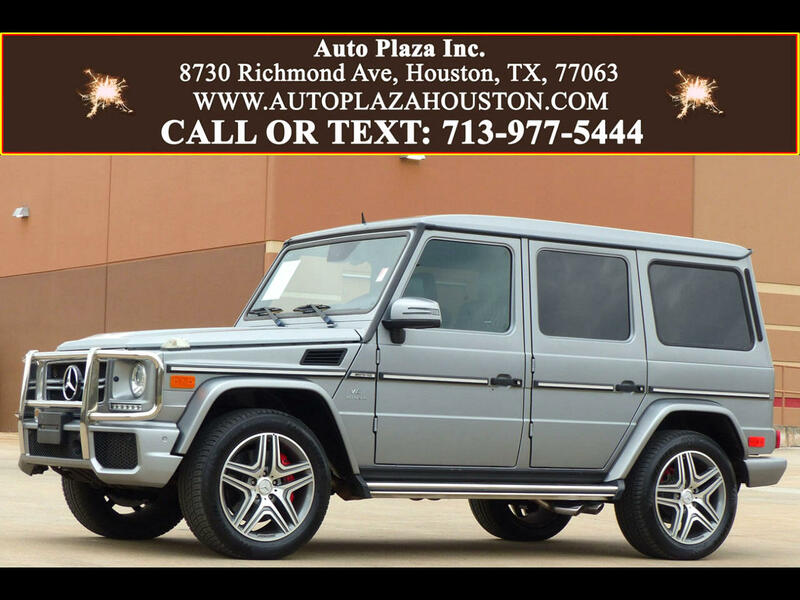 Used 2013 Mercedes-Benz G-Class G63 AMG 4MATIC for Sale in HOUSTON TX 77063 Auto Plaza, Inc. Celebrate Status!!! ABSOLUTELY STUNNING Auto Plaza Presents This Low Mileage 2013 Mercedes Benz G63 AMG with the Slick 7 Speed Automatic Transmission. This Vehicle screams SUCCESS, with its Advanced German Engineering, Seductive Styling, and Advanced Technological Features. It has PLENTY of Power and a Style Second To None!!! OPTIONS INCLUDE: Designo Magno Platinum Matte Finish ($3,950), Designo Exclusive Upgraded Interior ($4,950), Designo Carbon Trim ($2,950), Heated Steering Wheel ($200), Blind Spot Assist, Distance Assist, COMAND Navigation, Power Sunroof, Front and Rear Parking Sensors, Rearview Camera System, Premium Harman Kardon Audio, Bluetooth for Hands Free, XM Radio and NAV Traffic/Weather, CD/DVD Player, Xenon Headlights, 20inch Alloy Wheels, Paddle Shifters, Power Cooled/ Heated Front Seats, Heated Rear Seats, LED Daytime Lights, Memory for Driver Seat and Steering Column, Tire Pressure Monitor, Power Locks, Power Windows, Tilt Steering, Cruise Control, Dual Air Bags, ABS Brakes, Power Steering, Rear Defroster, Automatic Climate Control, Rear Air Vents, Illuminated Front Door Sills, and Much More! The Advanced Mercedes Benz Technology and Engineering Ensures that you Experience Exceptional Handling and Stability, Offering you a Ride that is Safe and Secure. So, CALL TODAY to Schedule a TEST DRIVE!!! Financing Available!